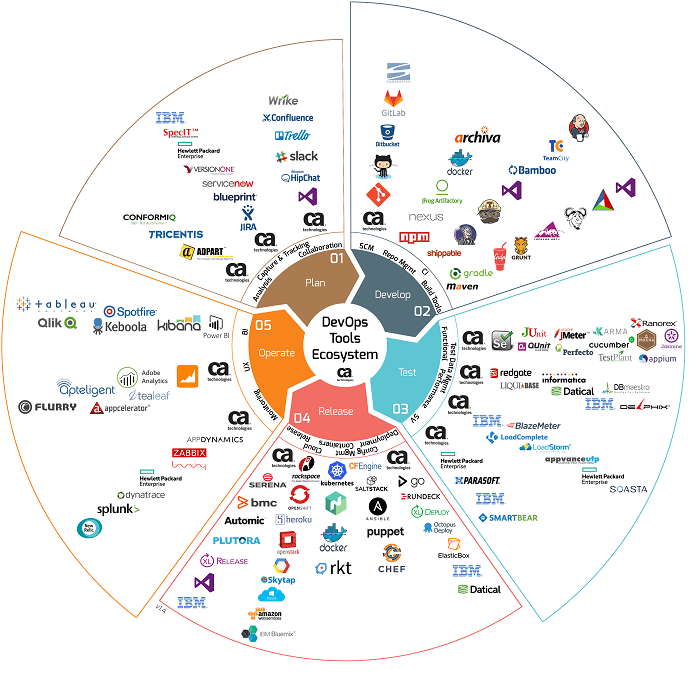 Welcome to part 6, which is also the final part, of our “Ultimate DevOps Tools Ecosystem Tutorial”. In parts 1-5 we gave an overview of the DevOps tools ecosystem and elaborated on the first 4 stages: Plan, Develop, Test and Release. This time we will go over the fifth and final step: operate. Operating is the stage that ensures maximization of the product’s abilities after it is up and running. This includes monitoring the UX, monitoring infrastructure, APMs and aggregators, and analyzing Business Intelligence (BI). Application monitoring (APM) monitors the inner parts of the application, including the language’s garbage collection performance, stack traces and the time it took to query databases and additional micro-services. This ensures smooth operation and the ability to track usage trends and system health. Though there are many successful APMs that we recommend, including AppDynamics, DynaTrace and CA APM and New Relic. In this post we will focus on New Relic. New Relic has a very strong user interface, detailed reports and above all it is very comfortable to use. New Relic provides plugins to any language and platform, thus automatically scraping metrics without the developer having to do anything. All the developers need to do is add the New Relic agent to the app they’re developing, and New Relic will automatically extract platform-specific metrics, whether in Java, node, php, etc. are loaded on that app. That’s it! New Relic reports will automatically be created and shown to you on the app’s APM page on New Relic’s website. To learn more about integrating CA BlazeMeter with New Relic, see this guide and for integrating with APMs check out this free webinar. Infrastructure monitoring provides insights into your underlying infrastructure and monitors server load, CPU, memory and more. It also examines connectivity between services, databases and external systems. If you need to drill down to the root cause, you can also use aggregated logging services such as ELK/Splunk and for visualizing events. The top tools in the market are Prometheus, Sensu, Zabbix and sysdig. In this post we will focus on Prometheus. Why? Because Prometheus is adapted for the container movement, uses service discovery to discover new applications, i.e users don’t need to manually configure new applications for monitoring and supports the pool based model. But above all, it is an open-source tool that is owned by the Cloud Native Computing Foundation, and not by a large company, making it a tool by users, for users. This was the last blog post of this series, which we hope you will find useful when choosing your work tools. To learn more about performance testing and it’s part in the DevOps cycle, visit our blog. To try out load testing for free with CA BlazeMeter, put your URL or JMX file in the box at the top of this page and your test will start in minutes.